Margaret Kennedy intently watches on as Fr Emil baptises her brother Wayne- as she is next! Picture: Supplied. FRANCISCAN Friar Dominic Levak and West Wyalong Mission Parish Priest Fr Emil Milat, combined again recently to extend Sacramental and pastoral care to the Aboriginal Catholic community of Lake Cargelligo. Fr Milat says there is steady growth in the number of Indigenous Baptisms taking place “out west”. “Br Dominic OFM* is able to meet the Aboriginal people in their time frame not being restrained by the often ‘appointment’ based culture of modern life,” Fr Milat said. According to Fr Milat, Br Dominic has been breaking new ground following the Holy Spirit’s lead in re-developing the semi-contemplative dimension of Franciscan Spirituality that the Order has let fade away somewhat over time. “With his Superior’s approval Br Dominic is undergoing a life of prayer and solitude at a beautiful chapel at Bolo,” Fr Milat said. “It’s about 28 kilometres north of the small town of Tullibigeal with 18kilometres of it being dusty dirt roads. “Once a week Br Dominic goes on mission to Lake Cargelligo and over the border to the Condobolin Parish in the Diocese of Wilcannia-Forbes. 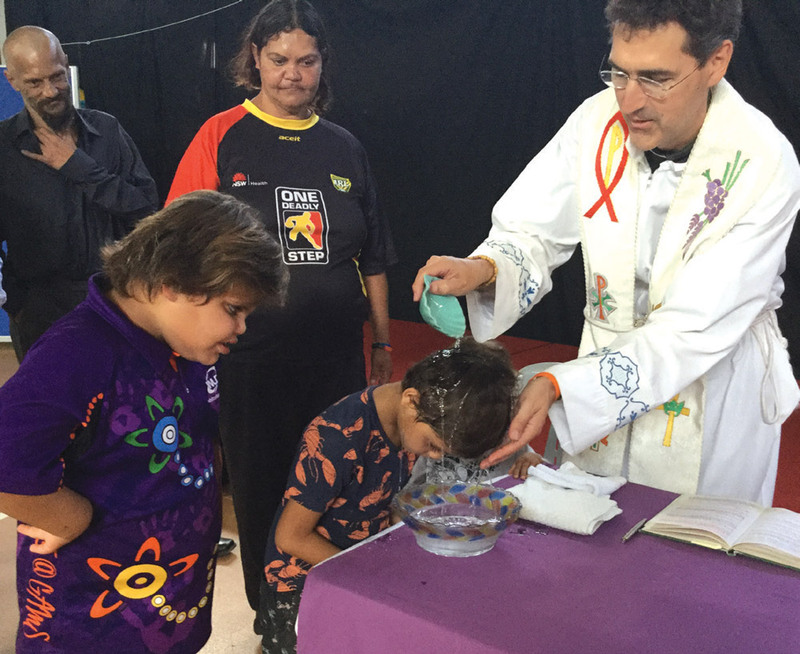 The Conventual Franciscan Brother and Fr Milat were joined by family and other parishioners as they celebrated the Baptisms of a number of Indigenous members. A barbecue in the park situated by Lake Cargelligo followed the Baptisms, while a decorated cake donated by the local ‘fisho’ (takeaway shop) was described as ‘lovely’. Fr Milat asking the Godparents Nadia Clarke, Lindsey McCann, Horis Vincent and Emma King, as part of the baptism Rite, to ‘Receive the light of Christ’ on behalf of the children. Picture: Supplied.